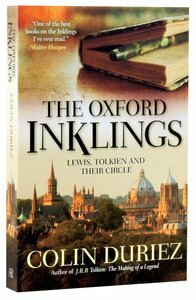 Acclaimed author Colin Duriez explores the lives, writings, relationships, and influence of The Inklings: an informal, eclectic group of thinkers - including C S Lewis and J R R Tolkien - who met in Oxford pubs and inspired each other to produce some of the most enduring literary works of the 20th century. The Inklings were an influential group of writers, along the lines of the Lake Poets or the Bloomsbury Group, centred on C.S. Lewis and J.R.R. Tolkien, who met regularly in the pubs of St Giles, Oxford, to read and discuss their latest writings. Acclaimed author Colin Duriez explores their lives, their writings, their ideas and crucially the influence they had on each other. Examining the clear purpose behind the group while celebrating its diversity and lack of formality, Duriez explains how this eclectic group of friends, without formal membership, agenda or minutes, could have a programme that shaped the publications and ideas of the leading participants. Who else was involved with the Inklings, and why do Owen Barfield and Charles Williams matter so much? What difference did World War 2 make to the group, and why did they eventually stop meeting? The Oxford Inklings explores the group's complex and fascinating interactions, and includes the women on the fringes such as Dorothy L. Sayers and Lewis's wife, Joy Davidman, Duriez also considers the Christian faith of the defining members, which influenced them greatly.This unique account of one of history's most intriguing literary groups will find itself on the reading list of every serious Inklings, Lewis or Tolkien fan. Colin Duriez is a well-known authority on C.S. Lewis, and the author of The C.S. Lewis Encyclopedia, A Field Guide to Narnia, Tolkien and C.S. Lewis and He frequently lectures on both radio and television about the author's life and works. His most recent works are Francis Schaeffer: An Authentic Life and Field Guide To Harry Potter.